These models apply irrespective of the complexity of the internal circuit of the amplifier. The values of the model parameters can be found either by analyzing the amplifier circuit or by performing measurements at the amplifier temlinals. The model for a voltage amplifier is shown in figure 1. Real amplifiers have input and output resistance. This is reflected in the model. 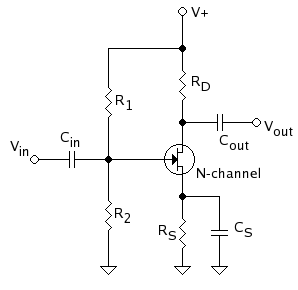 Figure 1: A Voltage Amplifier. Gain is the increase in the strength of a signal and is often expressed in decibels (dB). An increase of 3 dB is about equal to doubling in a linear scale. A gain of more than 1 is called amplification, while a gain of less than 1 is called Attenuation. Using the model, the gain with a load can be calculated. Input Resistance(general): Zg= Zb || R1 || R2, where R1 and R2 are the same as the picture above. As with BJT configurations, there are three FET configurations, each one corresponding to one of the terminals of the transistor. The transistor is "on" all the time. We say 360 degrees of conduction, representing an entire period of the sine waveform. Ideally, this class produces very little distortion, however consumes a lot of power and is also least preferred. This is the most linear of the classes, meaning the output signal is a truer representation of what was imputed. Here are the characteristics of the class: 1.The output device (transistor) conducts electricity for the entire cycle of input signal. In other words, they reproduce the entire waveform in its entirety. 2.These amps run hot, as the transistors in the power amp are on and running at full power all the time. 3.There is no condition where the transistor(s) is/are turned off. That doesn't mean that the amplifier is never or can never be turned off; it means the transistors doing the work inside the amplifier have a constant flow of electricity through them. This constant signal is called "bias". 4.Class A is the most inefficient of all power amplifier designs, averaging only around 20%. Because of the way they are usually designed, Class A amplifiers are very inefficient. They do not need to be built in this way, but for every watt of output power, they can typically waste 4-5 watts as heat. They are usually very large, heavy and because of the 4-5 watts of heat energy released per watt of output, they run very hot, needing lots of ventilation (not at all ideal for a car, and rarely acceptable in a home). This is not due to the amplifier type, but the fact that even many design engineers do not fully understand how they work and often copy their designs from previous ones. The upside is that these amps are the most enjoyed of all amplifiers. When properly designed, the Class A amp gives the best representation of musical detail, with no clipping of the waveform. As a result the sound is cleaner and more linear; that is, it contains much lower levels of distortion. They are the most accurate of all amps available, but at greater cost to manufacture, calling for tight tolerances and additional components for cooling and heat regulation. This type of amplifier is extremely easy to build and is the industry standard for audio amplifiers. Issues with this type of amplifier include poor efficiency, size and cost. A typical class ab amplifier will have a power efficiency of 40-80%. Because of this they require large heat sinks to cool the transistors, this also increases the cost of the amplifier due to the extra material to create these heat sinks. This is the compromise of the bunch. Class AB operation has some of the best advantages of both Class A and Class B built-in. Its main benefits are sound quality comparable to that of Class A and efficiency similar to that of Class B. Most modern amp designs employ this topology. Its main characteristics are: In fact, many Class AB amps operate in Class A at lower output levels, again giving the best of both worlds The output bias is set so that current flows in a specific output device for more than a half the signal cycle but less than the entire cycle. There is enough current flowing through each device to keep it operating so they respond instantly to input voltage demands. In the push-pull output stage, there is some overlap as each output device assists the other during the short transition, or crossover period from the positive to the negative half of the signal. There are many implementations of the Class AB design. A benefit is that the inherent non-linearity of Class B designs is almost totally eliminated, while avoiding the heat-generating and wasteful inefficiencies of the Class A design. And as stated before, at some output levels, Class AB amps operate in Class A. It is this combination of good efficiency (around 50) with excellent linearity that makes class AB the most popular audio amplifier design. There are quite a few excellent Class AB amps available. This is the design I recommended for most general-use applications in home and car. Usually, parts choice rivals that of Class A amps, and dollar for dollar these are some of the best values in stereo amplification. There can be some variation in design principle, but generally these are well-designed amps since their function is very well-understood by audio designers. The transistor is "on" for only half the cycle (exactly 180 degrees) of a sine wave and is also very typically used in push-pull amplifier circuits. Ideally this class produces mostly odd order distortion. In audio applications it is believed that odd order distortion is not pleasing to hear. It is difficult to build a low distortion Class B amplifier and hence Class AB is almost universal. In this amp, the positive and negative halves of the signal are dealt with by different parts of the circuit. The output devices continually switch on and off. Class B operation has the following characteristics: The input signal has to be a lot larger in order to drive the transistor appropriately. This is almost the opposite of Class A operation There have to be at least two output devices with this type of amp. This output stage employs two output devices so that each side amplifies each half of the waveform. [li Either both output devices are never allowed to be on at the same time, or the bias (remember, that trickle of electricity?) for each device is set so that current flow in one output device is zero when not presented with an input signal. Each output device is on for exactly one half of a complete signal cycle. These amps run cooler than Class A amps, but the sound quality is not as pure, as there is a lot of "crossover" distortion, as one output device turns off and the other turns on over each signal cycle. This type of amplifier design, or topology, gives us the term "push-pull," as this describes the tandem of output devices that deliver the audio signal to your speakers: one device pushes the signal, the other pulls the signal. They can be less expensive, because one can use two cheap output devices instead of one high-quality one in the design. The transistor is "on" less than half the cycle of a sine wave. We say <180 of conduction. This class produces both even and odd order distortion, however is very efficient. The class D amp has been developed after the short-comings of past generations, including classes A, B, AB, and C. Many people mistake the D as standing for digital. Although it is a “switching” amp, meaning it turns “on” and “off” at a specific frequency, it is a wrong assumption. D was simply the next letter in the alphabet. Consuming the least power out of its previous generations, the class D amps are generally smaller, making them ideal for mobile devices. It is because of their power efficiency, small size, and cheaper costs that the class D amps are quickly becoming the new industry standard for audio electronic. Companies such as Advanced Analog, Texas Instruments as well as other companies have released 50W stereo class d amplifiers that are the size of a penny and did not require any sort of heat sinking, something that was not possible with other types of amplifiers. The basic design includes two MOSFET transistors in series, one pFET and one nFET being driven by a pulse width modulated (PWM) signal. Because of the properties of MOSFET transistors they are either fully on or fully off. When the transistor is off and the current is zero (so the amount of power wasted heating up the transistor is zero), or the transistor is fully on and the voltage across it is very close to zero (so the amount of power wasted heating up the transistor is again, very close to zero). Because an analog signal needs to be transformed into a PWM signal a certain amount of distortion can occur, but the amount of distortion can be minimized. Because a PWM signal is very much like a digital signal, the sampling theorem states that if the sampling frequency is more than half the maximum frequency of the source it can be reproduced exactly. For audio signals the maximum frequency heard by humans is roughly 20kHz, so a PWM generator would only need to provide a minimum switching frequency of 40kHz. Because of the availability of faster components many class d amplifier designers will use switching frequencies closer to 400kHz to further reduce the distortion. Issues of concern with a class d amplifier include electromagnetic emissions. Due to the presence of a medium frequency signal in the circuit, steps must be taken to reduce the emission of these signals that could interfere with other electronic devices. ==== Class E ==== (oops, class D again?) Switching amplifier These amplifiers are erroneously called "digital" amplifiers by the press and many audio "experts." Here's the skinny on Class D: While some Class D amps do run in true digital mode, using coherent binary data, most do not. They are better termed "switching" amplifiers, because here the output devices are rapidly switched on and off at least twice for each cycle. Depending on their switching frequency, they may be "switched on" or "off" millions of times a second. Class D operation is theoretically 100% efficient, but in practice, they are closer to 80-90% efficiency. This efficiency gain is at the cost of high-fidelity. Think of Class D amps as being similar to a switchable power supply, but with audio signals controlling, or modulating, the switching action. To do this, you use a technology called Pulse Width Modulation (or PWM, a technology found in many CD players). According to experts, audio signals can be used to modulate a PWM system to create a high power audio amplifier at fairly low voltages using very small components. Class D audio uses a fixed, high frequency signal having pulses that vary in width based on input signal amplitude. So, for example, a deep bass note creates a large pulse in the carrier signal. This can be translated into a musical signal by the on/off nature of the output devices. Class D amplifiers are generally used for non-high-fidelity, or subwoofer applications. There is a fifth (and, nominally, a sixth) class of amplifier, but they are rarely seen in practice in the consumer market. One is the Class G and the other Class H. These are similar in design to Class AB topologies, but both feature two power supplies that switch on or off, depending on the musical signal imputed. Using two power supplies improves efficiency enough to allow significantly more power for a given size and weight. Class G is becoming common for pro audio designs. Class H amps are designed to use the same topology as Class G, but it provides just enough voltage for optimum operation of the output devices. Again, its an attempt to increase efficiency, but at the expense of fidelity ultimately.